1300SMILES was founded by Dr Daryl Holmes and has been listed on the Australian Stock Exchange since early 2005. With thirty one full-service dental facilities in ten major population centres in Queensland, Sydney and Adelaide, it is easy to find affordable quality dental care near to your home or work. Our corporate and administrative offices are located in Townsville. We can offer up-to-date treatments for your whole family, using only the highest quality materials. Above all, We Care and it is our priority to ensure you always receive great quality dental treatments at every appointment, in clean, comfortable and well-appointed surroundings. Every practice has been designed to offer you a relaxing and pleasant environment. 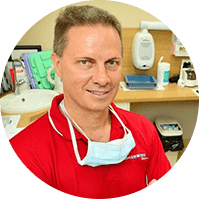 Each of our QIP accredited practices has up-to-date technology that is maintained to extremely high standards and which is only operated by our professionally trained staff. Our conveniently located practices offer extended trading hours and plenty of parking.